Movie Review: M. Night Shyamalan’s “The Visit” can be defined as a kids’ parody that eventually turns into a hysterical domestic horror adventure, never sufficiently scary to be recommended. If you want an idea of its tone and mood, think of the farcical ambiance of “Home Alone” added up to those pseudo-documentaries known as found footage films (“Rec”, “Paranormal Activity”) in which the characters narrate and record the events with a hand-held camera that is usually more agile than the developments of the plot itself. The film starts with a mother (Kathryn Hahn), explaining to the camera how she fell in love with an older man (who left her afterwards for another woman) with whom she had two children and escaped home against the will of her parents. The same parents, 15 years after she has left, discovered her through the Internet and arranged everything to host the two grandchildren they’ve never met in their isolated Pennsylvania farm. The teenagers Rebecca (Olivia DeJonge) and Tyler (Ed Oxenbould) become enthusiastic about the visit and depart equipped with a camera in order to continue the documentary about the family, already started with an interview with their mom who, meanwhile, takes the opportunity to have some fun with her new boyfriend. However, what they find there, including the wintry landscapes that limit their hide-and-seek games, is not so cheerful. The scenario is intentionally clumsy since the beginning when they realize there’s something wrong with the grandmother (Deanna Dunagan) besides cooking and cleaning compulsively. Moreover, the granddad (Peter McRobbie) has inexplicable, abrupt changes in behavior, and together with his wife, is the center of the odd occurrences that lead to the flimsy final conclusions. 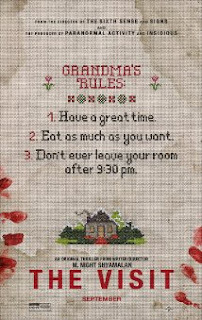 The best in “The Visit” are its visuals, brilliantly adorned through an effective use of light and nicely mounted sets. Apart from this, most of the situations that come out of the lame script are pretty stupid, and the film never manages to succeed, whether in comedy or horror. Clearly, Mr. Shyamalan embraces a worthless phase as a filmmaker and screenwriter. For a few years now, I can’t find anything solid in his filmography to recommend, considering that “The Happening”, “The Last Airbender”, and “After Earth” are cinematic aberrations. Long are the glorious days of “The Sixth Sense”, “Unbreakable”, and “Signs”.